Holly jumped into my view for a couple of weeks and I thought it a good subject to jump back into blogging. So today we will chat about the mystical, magical Holly bush. But first, we have made some changes here at Shamanic Connection. Our last post let you all know that we are simplifying our lives and moving into a semi-retirement. As part of that simplification, we have merged our blogs, Shaman’s Blog and Nature Wise, and moved them into Shamanic Connection’s website. So now, all our posts will be found here. Don’t worry; the old links have been redirected in case you forget. This has been a process and I’m still working at making things pretty and making sure all the links and images have transferred. If you find a broken link or image, please email me and tell me where to correct it. 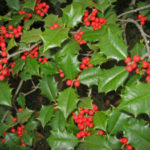 Now on to Holly … Beautiful, lush evergreen leaves and bright red berries … it is no wonder Holly is a symbol of winter. When all other trees and plants have gone dormant for the winter, the holly can be found still be dressing the bare landscape in red and green. During the dark, cold days of winter, our ancient Ancestors brought evergreens into their homes to symbolize hope and a reminder of the renewal of the springtime to come. The ancient Celts would bring holly in to brighten up their homes and as a symbol of good luck. In England, holly branches were brought into the home to provide faeries with a place to play during the cold winter months. Holly is said to be a “par excellence” protective herb, it protects against lightning, poison, and evil spirits. Just as the oak attracts lightning, holly repels lightning. It was often planted around homes for protection from lightning, and for this reason it is viewed as a symbol for protection. Interestingly, science has actually discovered the distinct leaf-shape of the holly acts as a natural repellent for lightning energy, making the holly’s protective significance more than just lore. Holly also is said to protect against witchcraft and evil spirits. A stout holly stick was a good thing to have when walking on a dark night. It was said that throwing holly at wild animals makes them lie down quietly and leave you alone. (Hmm … I think I’d want the “stout stick” too …) Builders made cottage doorsteps of holly wood so that witches could not enter. If you see an old holly hedge around a cottage, it may have been deliberately planted as a lightening block (and witches too). Holly is also associated with dreams and the subconscious. Druids would often invoke the holly energy for assistance in dream work as well as spiritual journeying. In the north of England, holly was used in rituals to dream of one’s future husband. Energetically, Holly helps open the heart and awaken compassion. It assists us in understanding “misunderstood” emotion and reminds us of the importance of “right” emotional expression. Holly can help to awaken the Christ energies within and can help one to open up to the angelic and faerie realms. Also considered a masculine energy, Holly holds the energy of the spiritual warrior. It activates the masculine energy in a creative manner. (Here again we see the balance of masculine and feminine – spiritual warrior and heart opener.) When aligned with Holly energy, it is important to be clear about your purpose and not to scatter your energy. The prickly holly leaves serve as a metaphor for protection, vigilance, and stubborn victories won. Call upon Holly energies when you are hesitant about what you are involved in. Invoke its protective qualities when you need to be more assertive. Holly energy will protect and bolster you to victory. So, gather some holly and dream this Yule of the renewal of spring. May your dreams with Winter Solstice be filled with peace, love and joy as the light returns and the days grow longer. Gary and I both wish you a Blessed Yule.